Thunder storms off the coast subside to reveal the quiet entrance of thousands of cars. The hustle of packing everything and moving it over the trek to the destination. Kids, chairs, umbrellas, LOTS of cameras. 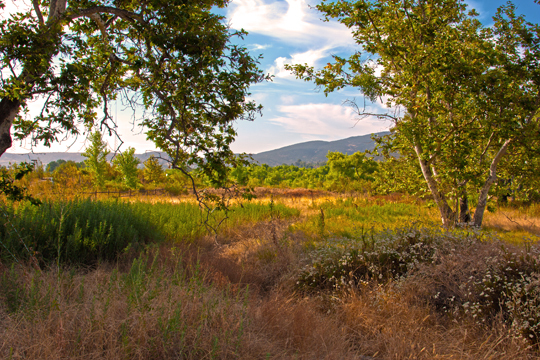 The silence of the morning is contrasted with the obvious drive in everybody to get where they are going. The sun breaks the sky and the Air Show Starts! The show starts with R/C planes flying off in the distance. 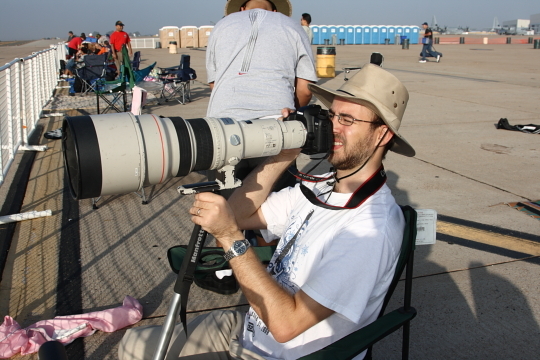 There are highly maneuverable and from some of the photos can be confused with the real thing. Our vantage point only allows us glimpses of these planes so we wait and apply sun screen in preparation for the long day. Soon the wait is rewarded with the morning performance of Sean Tucker in the Oracle Challenger III. During this performance Sean will perform tricks that no other performer can replicate. He also pulls the most negative-g maneuvers I have seen. Sean can put the plane in a hover, fly it backwards, do a myriad of other things that boggle the mind. 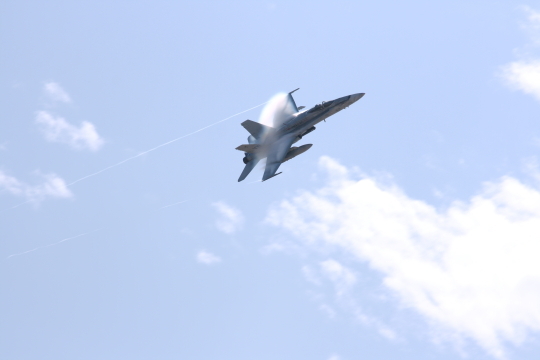 The air show is worth it just to see him perform. 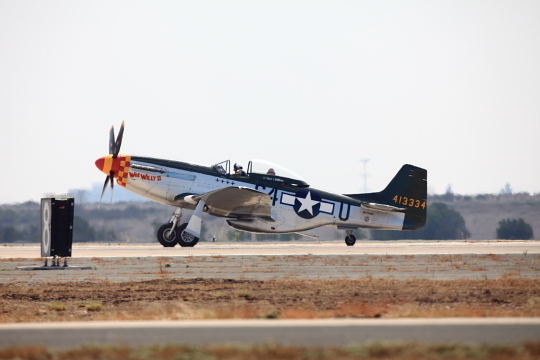 The next aircraft to perform was a stand in since one of the AT-6 planes had mechanical problems. So instead the audience got to see the slowest plane at the air show, an Antonov An-2 biplane. This plane is massive for a single engine aircraft and yet it can take off from distance as short as 170 meters (558 feet). The design is old but it continues to be produced in some countries even today because it is reliable and safe. The very next powered craft to fly was John Collver in his “Wardog” AT-6 “Texan”. The AT-6 was used as a trainer and so John flies in the smooth and simple maneuvers that pilots would have learned back when this airplane was used. The AT-6 is massive and powerful for a single engine trainer. The show turns a page and the military exhibitions begin with the afternoon portion of the show. In quick succession the U.S. Army Golden Knights Parachute Team take flight along with a whole slew of military aircraft from Cobras to Osprey to Falcons and Hornets. These all fly off and the Golden Knights parachute out while the National Anthem plays. The last jumper has the American Flag flying off of the back of his parachute. 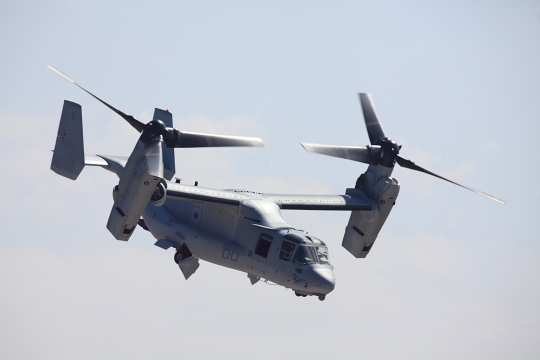 Immediately after he lands, the most exciting part of the air show gets under way; MAGTF! 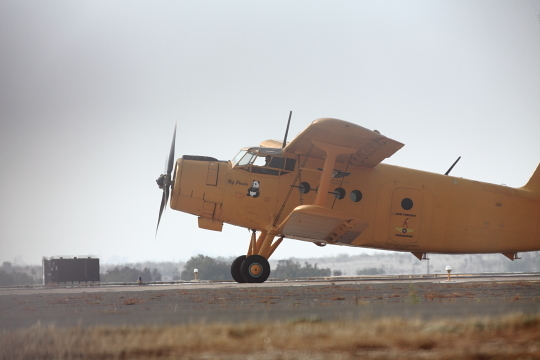 The Marine Air Ground Task Force demonstration shows in quick succession a coordinated air and land effort to take an important strategical asset. AV-8B Harriers do mock strafing runs while F/A 18 F Super Hornets go on mock bombing runs. UH-1 Huey helicopters bring in ground troops to fast rope in and secure the landing zone. MV-22 Osprey fly in using airplane mode for quick arrival and then transition to helicopter mode to drop off their troops. AH-1Z Cobras secure the area for the ground troops while CH-53E Super Stallions air drop light vehicles in the distance. Soon after the armored vehicles arrive including armored personnel carriers and M1A2 Main Battle Tanks. The whole time the ground troops seek cover and cover each other’s movements as they advance. The Hornets and Harriers fly by doing a mock mid-air refueling run. Finally the troops reach the stands and the demonstration is over. 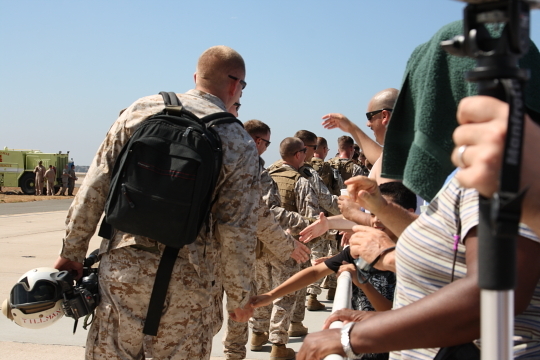 The tanks and the troops travel along the flight line to leave and shake the hands of the audience on the way. That concludes MAGTF! Next up the Super Hornet does a legacy flight with an F4U corsair. 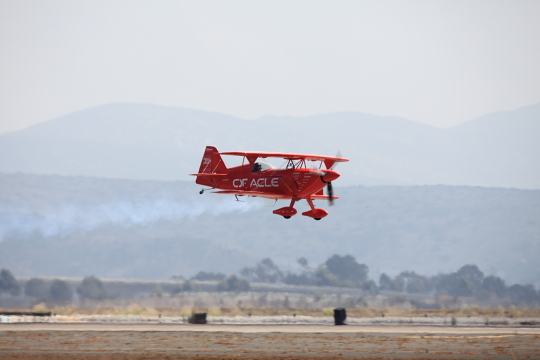 After that Sean Tucker performs again is his Oracle Challenger III. 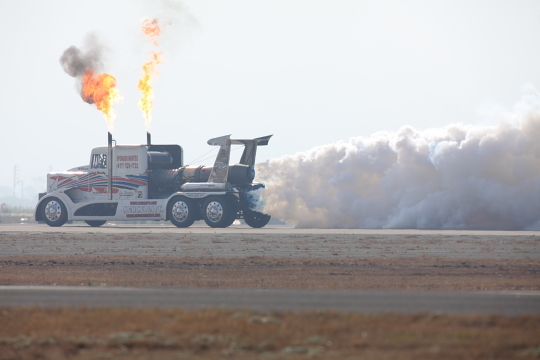 Then the audience gets to see a Semi-Truck tractor fitted with a jet engine on the back do afterburner runs down the runway. They call this Shockey’s “ShockWave” Jet Truck. 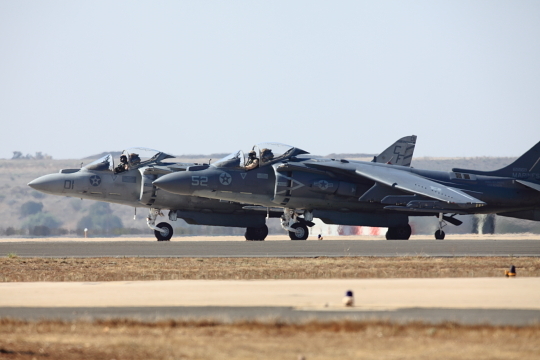 Then the same AV-8B Harrier which was in the MAGTF demonstrates vertical landing and take off. Second only to the MAGTF demonstration in excitement is the demonstration which comes up next. 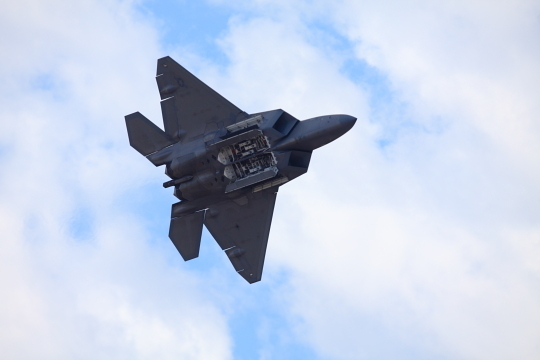 This is of course the F-22 Raptor; the premier air superiority fighter in the world. 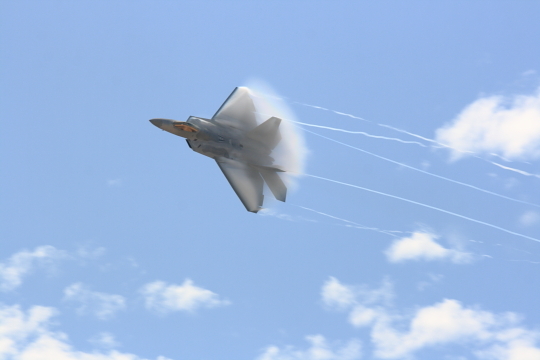 The F-22 demonstrates its unclassified maneuvers for the audience like low altitude recovery from a complete stall, flying with a negative air speed (flying backwards), power loops, and turns in a radius that outclasses any other fighter at the show. Because the F-22 has thrust vectoring, it can fly with an angle of attack higher then even the Super Hornet and turn tighter as well as achieve Supercruise speeds of breaking the sound barrier without using afterburners. 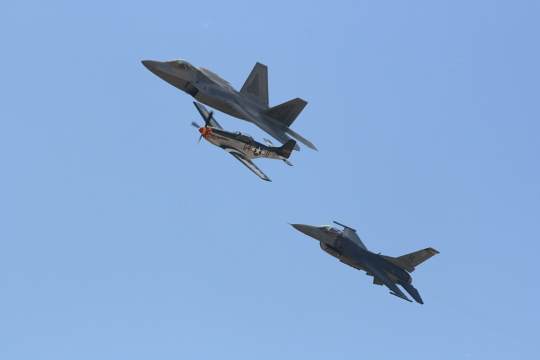 While the Raptor stayed in the air it was joined by an F-16 and a P-51 Mustang for a legacy flight. This provided excellent photo opportunities to the crowd below as they all had to fly at the speed of the Mustang. 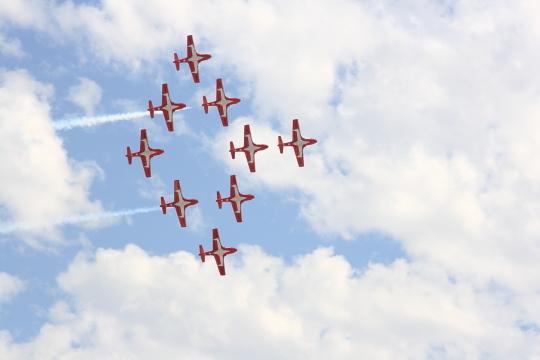 The afternoon show finished out with a demo by the Red Bull Helo which can fly upside down in loops and the Canadian Snow Birds which do just about every formation flying trick that the Blue Angels do. The last performers of the afternoon were of course the Blue Angels who make their flights always appear completely effortless while flying in ridiculously close proximity to each other. All in all it was a good day and worth it if you can ever make it out. 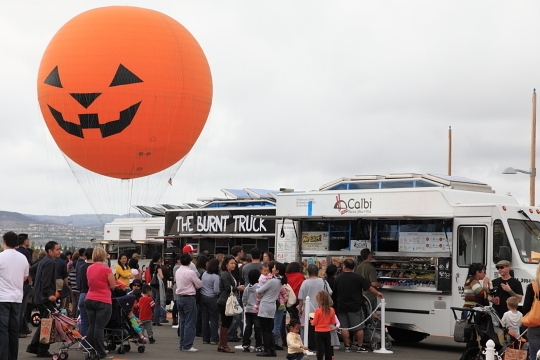 This past weekend Bryan and I, along with his mom and siblings, went to the Great Park Pumpkin Harvest which took place at, where else, the Great Park at Irvine. 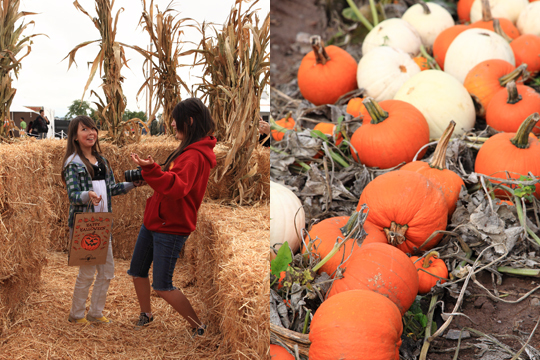 The event included lots of fun things such as a hay maze, wagon rides, a pumpkin patch and pumpkin decorating. Although this event was fun it is heavily geared toward children. 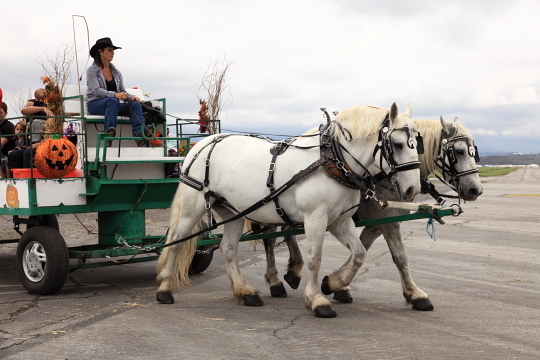 I stupidly thought that the phrases “Pumpkin Harvest” and “pumpkin patch” meant there would be an abundance of pumpkins to choose from so I brought my trusty wagon. Unfortunately they only gave one pumpkin to each child who was under 12 years old. Luckily we had my husband’s younger sister there or we would have come home with nothing! Despite this unfortunate pumpkin incident we had a pretty good time, we got to ride in a horse drawn wagon and go trick or treating. Well sort of, we did walk around and get candy from a bunch of different vendors which is pretty cool too. 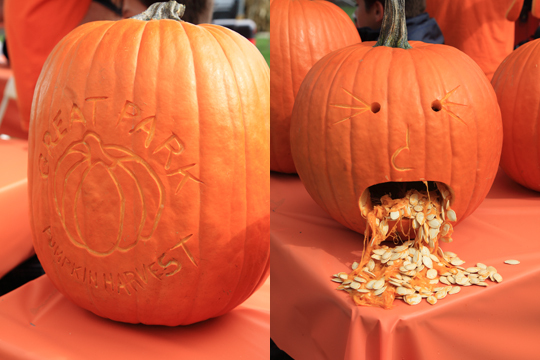 I don’t know if I would go to this event again but I would definitely recommend it to people with kids (under 12 obviously), if you want to go to real pumpkin patch I would go to Cal Poly’s annual Pumpkin Festival. We have had our dogs for a few months now and one of my favorite things to do is bring them to dog friendly events. I am practically obsessed with finding fun stuff to do with the dogs. One of my favorite websites is OC Dog Friendly. I am not really a fan of dog parks but I love dog walking events. 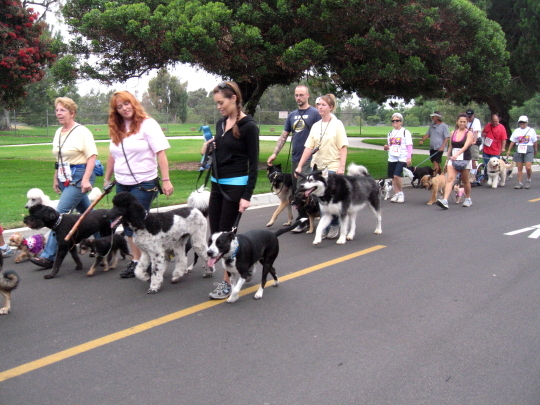 Earlier this year we did one of my favorite dog walking events with our dog Pearl appropriately called the IVHS Dog Walk. The great thing about that event is it requires some exercise for you and your dog. I am a big fan of 5K’s and I really wish there were more 5K events that allow dogs. 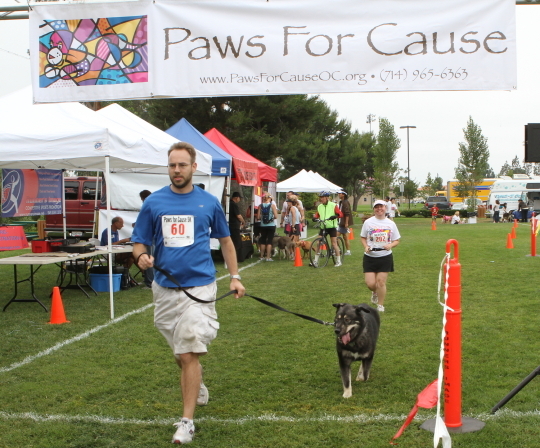 We participated in one back in July called Paws For Cause which took place in Fountain Valley at Mile Square Park. We brought our dog Maxx along to this event. Maxx is a bit dog aggressive but this was the perfect opportunity to allow him to be around other dogs in a controlled environment. Maxx did fantastic and loved running alongside Bryan and I for a few miles. 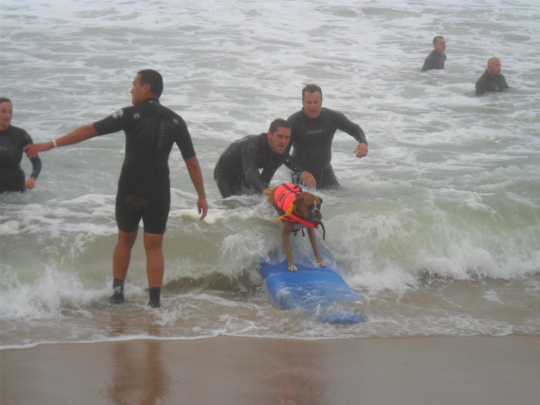 Another great event I attended recently was the Surf City Surf Dog which took place at Huntington Beach. 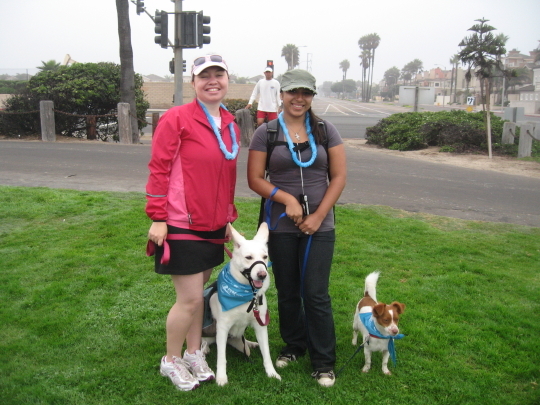 My friend Claudia and I, along with our dogs Pearl and Gizmo, participated in the Woofin’ Walk which was a 2 mile walk along the paved bike path. This event had less participants than the Paws For Cause 5K but it was also for a good cause. Five dollars of your registration fee goes to one of the five charities that sponsors the event, including Coastal German Shepherd Rescue who I adopted my dogs from. I suggested to one of the event organizers that they should turn the Woofin’ Walk into a 5K. Hopefully they will do that next year. The great thing about this event is that it takes place at Huntington’s famous dog beach which I had never been to before. 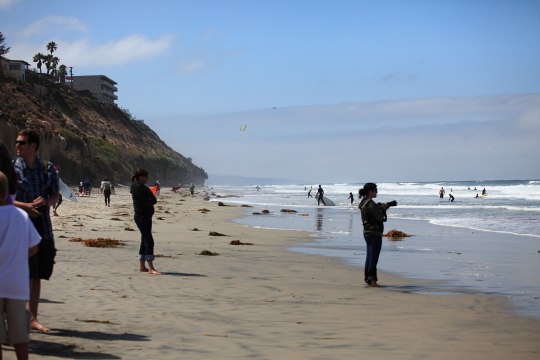 We had a lot of fun hanging out by the water watching the dogs surfing and the dogs loved it too. All of these events are great for dog owners and I highly recommend them for anyone who wants to get out and have fun with their fur buddy. YOUR PHOTOS ARE HERE! 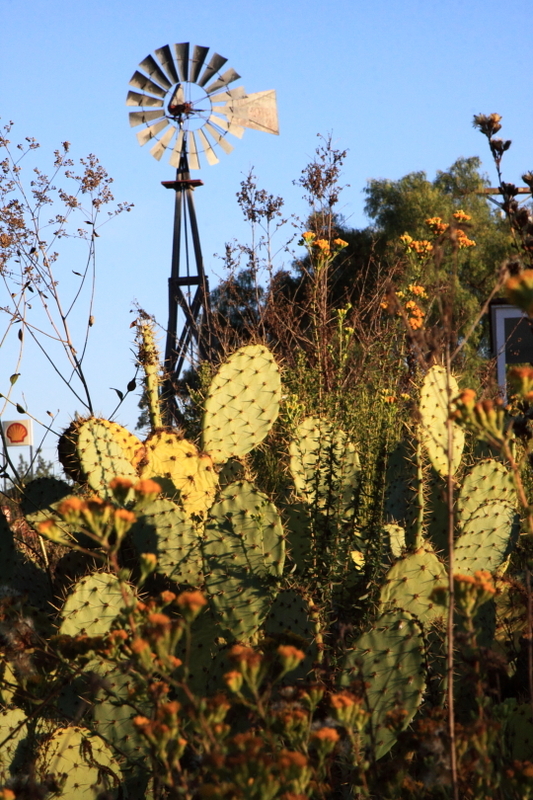 PLEASE VISIT OUR ZENFOLIO GALLERY TO SEE YOUR RACE PHOTOS. Photos from Race 3 are here! They have not been tagged by bib number or name yet but that should be done by the end of the week. Check out your race photos on our Zenfolio Gallery right HERE. 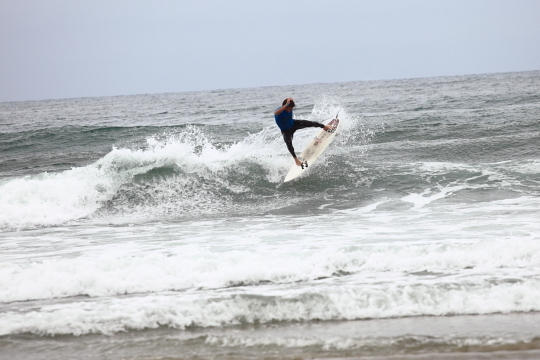 This past weekend Bryan and I went to the Switchfoot Bro-Am. We first went to to this event four years ago but haven’t been able to come back until this year. 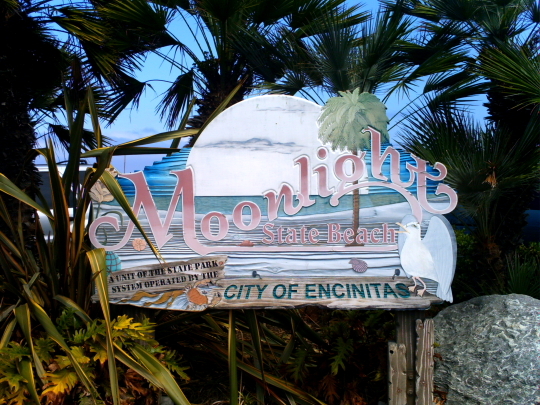 The Bro-Am takes place in Encintas, the home town of the band Switchfoot, at Moonlight Beach. 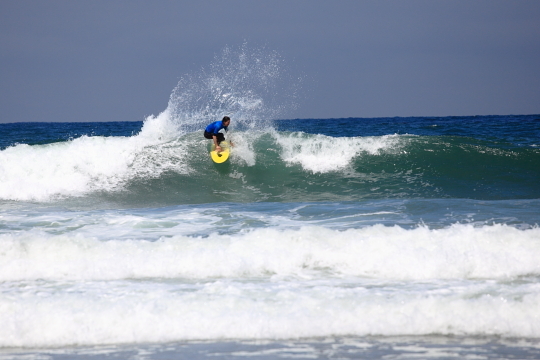 We got there around 7:30am during the start of the surf competition. As with most mornings at the beach it was very overcast and cold during the first few hours we were there. We watched multiple teams compete in heats. Teams included Hurley, Jedidiah, Billabong and other surf related retailers. The main heat between the guys of Switchfoot and the editors of Surfrider magazine was by far the most popular. While Bryan took a lot of photos of the other teams I grabbed the camera to shoot some closeups of the band getting ready for their heat. While all the press gathered around the Switchfoot guys I couldn’t help feeling like paparazzi. 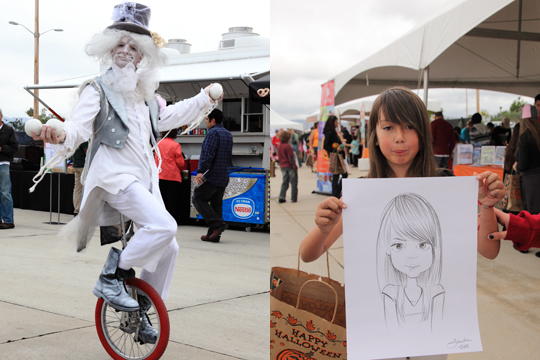 Although we didn’t stay for the whole event this year there was still lots to see. There are many vendors on the beach selling food, band memorabilia and giving out free samples. The best part is that there is a concert that goes on most of the day which includes many different artists with Switchfoot being the main performer at the end of the day. Besides the fact that this event is put on for the local charity Standup For Kids, this is a family event for the guys of Switchfoot. I saw the whole Switchfoot clan gathered around cheering for the guys, from wives to kids to grandparents and local friends. It just shows how down to earth these guys are and that they have never forgotten where they came from, after all Moonlight Beach is the place they grew up surfing at when they were kids.